Take two capsules in the morning and two capsules in the afternoon, preferably with meals and 6–8 . oz. of water. Do not exceed more than four capsules in a 24-hour period. To be used as a part of a proper diet and fitness program. Mix 1 scoop with 6-8 oz. of water 15-30 minutes prior to workout. For amplified results, mix 2 scoops with 10-12 oz. of water. 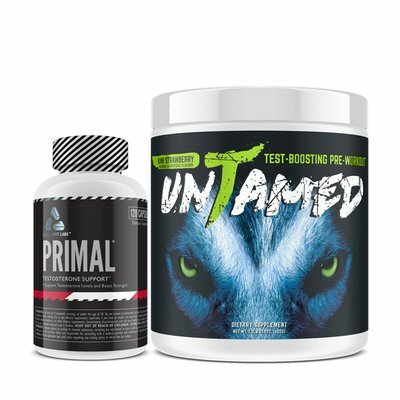 Primal went beyond any other natural testosterone product that I have ever tried! I gained 3lbs of muscle mass and even dropped almost 1% of bodyfat! When I first started taking Primal, I was bench pressing 185 lbs. After two months, I could press 250 lbs. My arm curls went from 40 lbs. to 70 lbs. I feel so much after talking Primal. Can feel myself getting stronger after each lift with unTamed. Love the pump benefits and there is no crash. Pineapple Mango is killer! Have been using unTamed consistently for 2.5 weeks. Great gains, awesome taste. I love this pre-workout. UnTamed is the best pre workout I’ve tried yet! Gives me energy through out my entire workout. Doesn’t make me all jittery like some of the other products I’ve tried. Take two capsules in the morning and two capsules in the afternoon, preferably with meals and 6–8 . oz. of water. Do not exceed more than four capsules in a 24-hour period. To be used as a part of a proper diet and fitness program. Do not use if pregnant, nursing, or under the age of 18. Use only as directed. 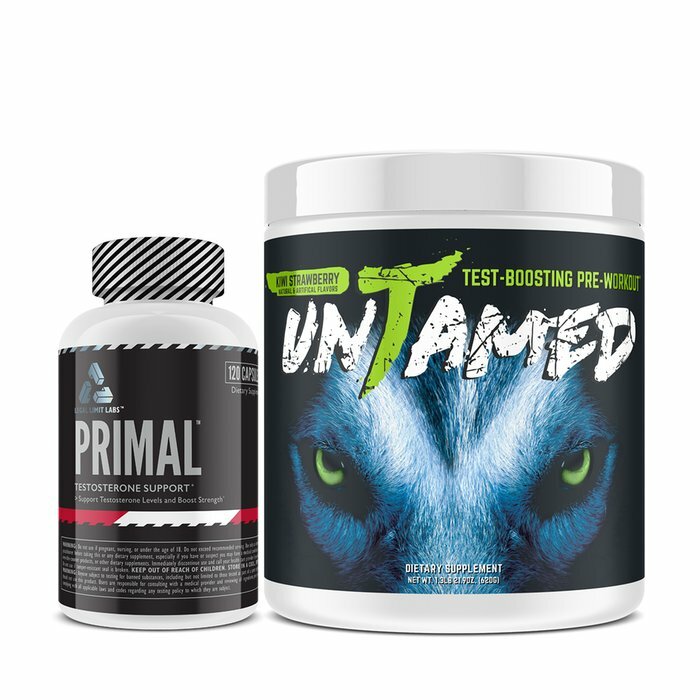 UnTamed Pre-Workout contains approximately 400 mg of caffeine per serving, and may not be appropriate for stimulant-sensitive individuals who may experience rapid heartbeat and nervousness. Do not consume with any other stimulants, including caffeine. May cause dehydration, nausea and/or dizziness with inadequate water intake. Consult with a doctor before taking this or any other dietary supplement, especially if you have or suspect you may have a medical condition, or are taking any medications, over-the-counter products, or other dietary supplements. Immediately discontinue use and consult your doctor if any adverse reactions occur. 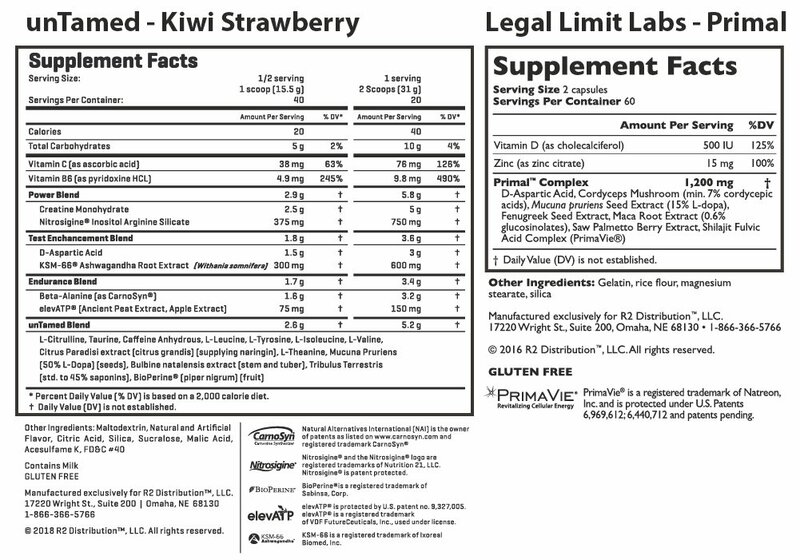 NOTICE: Any person who participates in sports and/or any other competitor in sports who is subject to the WADA – Anti-Doping Code, or is subject to similar codes or other rules regarding the use of supplements in sports, should not use this product. Users are responsible to consulting with a medical provider and reviewing all ingredients prior to use. Users are responsible for complying with all laws and codes regarding participation in sports. Do not use if tamper-resistant seal is broken. KEEP OUT OF REACH OF CHILDREN. STORE IN A COOL, DRY PLACE, AND AVOID EXCESSIVE HEAT.